Upper Level near Greetings and Readings. Contact us for Catering information today. EXPERIENCE THE DIFFERENCE BETWEEN NITROGEN ICE CREAM AND YOUR AVERAGE, STALE ICE CREAM. FRESH IS BETTER! 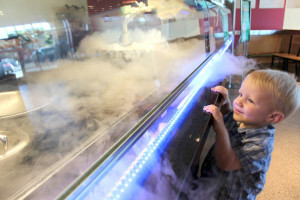 Sub Zero Nitrogen Ice Cream features desserts frozen with Nitrogen right in front of your eyes. We offer regular and low fat ice cream, custard, Italian Ice, yogurt and several Non-Dairy options that can be customized. We blend each guest’s creation by hand. Yes, we might work a little harder, but you get some of the smoothies ice cream available with no air whipped into it. After all, who wants to pay for air…. It’s like getting a bag of half empty chips. With over 40 flavors and over 30 mix-ins you are bound to find the combination you are craving. Smoothies, shakes and ice cream pies are also available. Take home a pint or quart for later. There are millions of possibilities when you “create your own” at Subzero Ice Cream. Try our deliciously fresh ice cream milk shakes, smoothies and pies. We have recently added Oat Milk to our Non-Dairy line up of offerings as well as KETO Ice Cream – 0 Carbs, 0 Sugar – Incredible flavor!